This page contains a summary of semi-technical information that may be of interest to Teachers or Mentors. 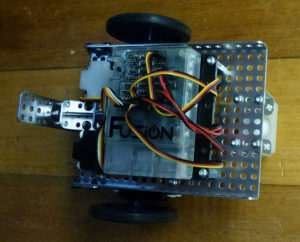 If you are a beginner who is eager to get on with building your Fusion Robot, ignore the stuff below, and start building your Robot. You can tell your Fusion robot what to do using a version of Google’s Blockly computer language, which is an excellent language for beginners. For more advanced users, the computer language Python (which is very popular in industry) can be used with Fusion. If you have not used Robots before, we strongly suggest you start with Blockly, because Blockly is easier for beginners, and Fusion is designed to make any later conversion from Blockly to Python a reasonably straight-forward process. Fusion is unusual in that the documentation and compilers are all mounted within the Fusion Robot itself. Because Fusion can act as a local Wi-Fi source, all that is needed for you to control your Fusion Robot is a Wi-Fi link from your laptop to your Fusion Robot. Once you have connected these two using a browser (preferably Google’s Chrome browser) you do not need a connection to the Internet. Not needing the Internet can be a blessing if your Internet connection is as slow as a tortoise with sore legs, or if your school has forbidden student laptops to be connected to the internet. In both cases your local Wi-Fi link between your laptop and your Fusion robot is all that is needed to get started. All this software is designed to work within a browser. Modern Robotics recommends using Google’s widely-available Chrome browser, versions of which are available on most recent computers running Microsoft’s Windows operating system, recent Macintosh computers, and computers running many Linux distributions. If your computing device is using an older or different operating system, check Google’s advice here.